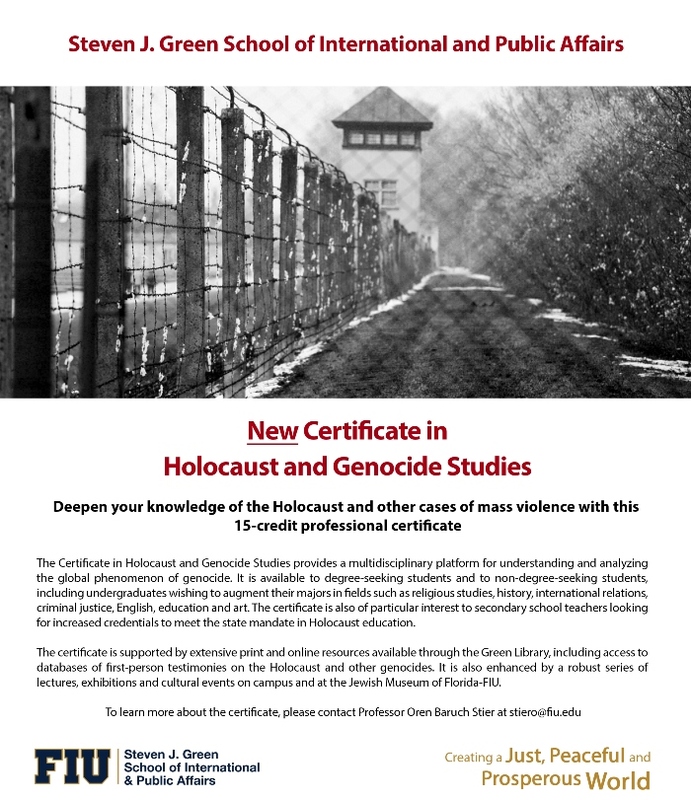 The FIU Holocaust and Genocide Studies Program seeks to establish a university-community partnership in expanding our classroom and public offerings related to the study of the Shoah and other instances of genocide. Building on our past history of high quality lecture series, invited speakers, educational performances, and museum exhibitions, we also draw on the collective strengths of our faculty and facilities, including the collections of the Jewish Museum of Florida-FIU and The Wolfsonian-FIU, in order to promote the importance of studying and analyzing mass violence and genocide. Our ongoing engagement includes a certificate in Holocaust and Genocide Studies, online course development, lecture series, continuing education, scholars-in-residence, and more. Our aim is to strengthen university and community Holocaust and genocide education for the 21st century from an integrated and multidisciplinary perspective.